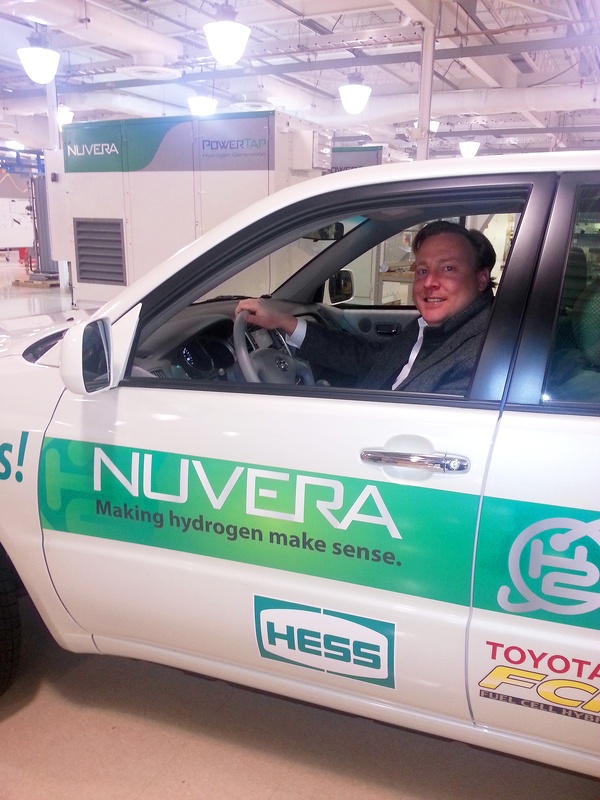 PRESS RELEASE: Billerica, Mass., April 17, 2013 — Nuvera Fuel Cells has inaugurated a program with Toyota Motor Sales, USA, Inc. (TMS) in which Nuvera will operate and maintain two Toyota Advanced Fuel Cell Hybrid Vehicles (FCHV-adv) at its headquarters in Billerica, Massachusetts. The two-year program is the first of its kind in Massachusetts and will help build awareness of fuel cell technology, the benefits of hydrogen as a clean fuel, and the development of hydrogen infrastructure in the Northeast. Update: Since this press release Toyota has introduced the Mirai and featured Nuvera in a 2015 video that went viral on YouTube, watch "Fueled by Bullsh*t." The video demonstrates the use of methane captured from cow manure to produce hydrogen and fuel a fuel cell vehicle.